Publicity photo circa 1944. Click for full version. 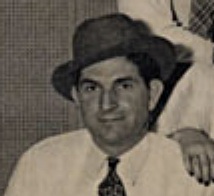 As a Blue Grass Boy: Curley Bradshaw played guitar and harmonica with the Blue Grass Boys, and apparently was featured on harmonica in performance. Unfortunately this harmonica playing is undocumented; the one recording session on which he appeared has him only playing an inaudible second guitar.